I love Zoe's Kitchen! (See, there is was) If you aren't familiar with it, it's a fresh healthy Mediterranean restaurant that is popping up everywhere lately and I am an avid fan. Zoe first caught my eye in Nashville when I was looking for a quick, healthy bite to eat. It is not a "drive-thru" fast food restaurant but it is quite fast. I usually call it in or just stop by and grab it to-go. I started with their chicken kabobs and a side of pita and hummus. Moved on to their orzo tabbouleh as a side, and then finally landed on their braised white beans. Now, I almost always order the white beans as a small meal. (Side Note: they also have the biggest and best chocolate chip cookies around...seriously...you can spend a whole day eating one). I always looked forward to lunch in Nashville because it meant that I had a chance to eat at Zoe's again. A few months back I was driving to my local grocery store and loe and behold like a shining beacon...I saw what I thought was a Zoe's sign on the horizon. Ofcourse...I forgot all about groceries and had to investigate. It was in fact a Zoe's kitchen...In MY hometown. I suddenly got very hungry and decided that a 3pm lunch was exactly what I needed, afterwhich I proceeded to text all of my friends to formally introduce them to what would likely become their new favorite lunching location. The other night I needed a quick and easy side dish to some grilled chicken I was making and all I could think of was the buttery, rosemary infused braised white beans from Zoe's and I decided to create a quick version...long version still to come. Drain and rinse beans. Heat olive oil, butter, rosemary, onion and garlic in a medium saucepan and let simmer together for 2 minutes. Add chicken stock, beans, salt and pepper and gently stir. Cook over low heat for 10 minutes. Because we are using canned beans, which are overly tender to begin with, do not stir too often or too aggressively to avoid ending up with mashed white beans....which will still be tasty...just not as pretty. Just made these and they taste great! Just like Zoe's :) Do you think they puree some of the beans to make it creamy like it is there in the restaurant? I emailed Zoe's and was told they cook them for 4 hours in the oven covered. they use canned cannellini beans. I personally use dried white beans and cook them for 6 hours covered in a 300 degree oven. I used this recipe as a starting base and they came out great. The Zoe's kitchen ones are vegan. I used veg stock. 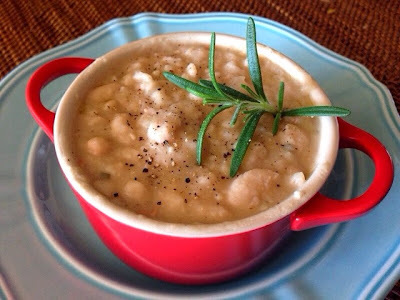 I used beans I cooked from dry and mashed a few which gave it that creamy texture. Smarty Pants! These look fantastic and I can't wait to try them. I've never heard of Zoe's before so after a quick Google search, there is one close by my work that I will now we trying! Thanks for sharing!